A Kreature which was created by gene splicing various micro-organisms, which mutated into a Kreature. 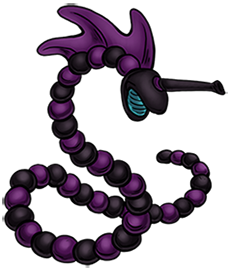 It uses the fontanellar gun on its head to launch a blast of corrosive black poison at its foes in a liquid or gaseous form. The "fin" on its head is actually a sensory appendage which enables it to aim with incredible accuracy. It is able to reproduce by shedding its segments, which grow into more Neerou, but if need be they can join back together.